Over the last few years I've made various energy saving changes not to just to better my pocket but to better the environment too. I'm always looking for energy and money saving products and recently I was sent an EcoEgg to review. I'd heard so much about them that I was pretty excited to try it out myself. EcoEgg is an award winning, eco-friendly, money saving product and is a complete replacement for washing detergent. The product consists of a hard plastic egg which is filled with two types of different mineral pellets which creates a powerful but all natural cleaning foam. 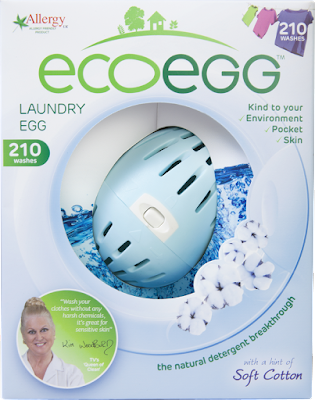 Simply put the Laundry Egg in with your washing and it will leave your laundry clean, fresh and soft. The Laundry Egg's comes in a range of different natural scents and wash amounts. Choose from Fragrance Free, Soft Cotton or Spring Blossom in either 54, 210 or 720 washes. We were sent the Soft Cotton EcoEgg with 210 washes which is priced at £9.99. You can buy refill pellets at any time and adding them to the egg is very simple to do. - It completely replaces washing detergent. - Long lasting from 54 to 720 wash per Laundry Egg and it's refillable. - Great for sensitive skin as it contains no nasties and is 100% natural. - Money saving. With the 210 wash EcoEgg each load works out as 28p per wash.
- Washing comes out clean, fresh and soft. There is literally nothing negative I can say about the EcoEgg. I'm just kicking myself that I didn't use it sooner as there's no going back to detergent, powders or capsules for me. EcoEgg is the way forward! 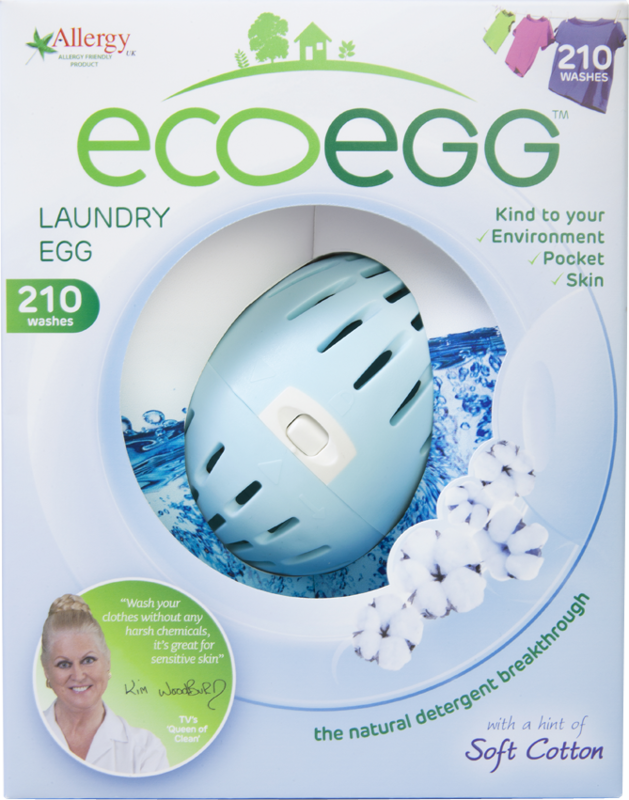 How would you like to try EcoEgg Laundry Egg for yourself? Well here is your chance! If you would like to win an EcoEgg (Fresh cotton and 210 washes) then all you need to do is enter using the Rafflecopter form below. Good luck! I think ecoeggs are fabulous value, great for the environment, but best of all they are kind to my family's eczema. Wow the EcoEgg sounds absolutely fantastic . I love that is a natural way to clean clothes and is also good for the environment . I think it's pretty amazing and would to give it a try. I like being environmentaly aware but the main thing is how much money it saves. Oh my mum got this one a few years ago and it was brilliant. I would love to have my own one. Saves a lot of money. it helps save you money! No messy liquids & its Eco friendly. It completely replaces washing detergent. Definitely the Eco friendly aspect. We try to keep everything Eco friendly in this household. I love the fact that it saves money and it's natural too! looks great, especially as it has no chemicals in it! I love that it is long lasting and gentle enough for sensitive skin. We are expecting our first baby next month and this would be fabulous! I would love to try this, it's cheaper AND natural, I'm asking myself why I haven't used this before too?! They are better for the environment! Wow it sounds amazing. I like that it is so light. Normally buying laundry detergent is a pain as it is so heavy to carry home. or 2. It will reduce what has to be carried home from the shops. And it all helps to have a simpler life! I've never seen anything like this! I love the idea of using an ecoegg to save money and do my bit for the environment. Plus it is one less thing to store in my cupboards! It looks so simple my husband can use it. I love the fact that the ecoegg is natural. I like that it is natural and you are not adding detergents into the water course. It better for the environment and it saves money too! Wow the fact that its 28p a wash sounds great for me on my student budget! I love anything that is natural! Money Saving is always a bonus! It saves you quite a bit of money in the long run. Great for sensitive skin as it contains no nasties and is 100% natural. It would save so much money. How long lasting & economic they are! As my son has just got eczema , this would be amazing to try and see if it helps . It's great for sensitive skin cos I struggle with mine. Anything that saves money is great for me! It has the potential to be much nicer for my sensitive skin! I love how you can save money, i'm on a big cut back at the moment and this would be perfect for helping! I love thrifty solutions and this is a cool one. It would be great for my sensitive skin. I love the natural and cruelty free thing about it. I've wanted to try one for ages! that it is great for sensitive skin and is 100% natural. Most of my children are oversensitive to detergents and perfumes. I would love to try this. My favourite thing about the egg is it saves money.. This sounds amazing ,would love to try one to see for myself . I like the fact it's replacing detergent I have stopped using conditioner a while back and I have to say my washing machine smells a lot better for it, replacing detergent would be even better, would love to try this. I like that it is natural and safe for sensitive skin! Money saving and no nasties. Fab that it's great for sensitive skin! It saves money, what else could an individual want! Great value and helps protect the environment. Eco Friendly and kind on your bank account! What's not to love? Wow, I've never come across these before reading your review. I'll be checking them out even if I don't win! Environmentally friendly AND money saving! a great way to save some money! Sounds fab - great for the environment,great for your family's skin and great for your purse - what's not to like!! I like how it's environmentally friendly and kind for sensitive skin. I've not yet used one, but it will be interesting to try. I love the fact it replaces detergent - no more hauling boxes home from the supermarket and having to clean the gunk out of the drawer in the washing machine! Environmentally friendly and money saving. My daughter has sensitive skin, so this sounds great. Very green too. I like that it saves money! I'm having my first baby in May and I have a suspicion my washing will greatly increase! the best thing about it is this giveaway! Someone new gets to try it... and I hope that is me! I like that this product contains no harsh chemicals, is hypoallergenic, biodegradeable and kinder to the environment. Anything that is better for the environment has to be worth a go! I think this is brilliant, just thinking about the amount of money it would save makes me happy and I love anything that is natural and time saving. that it lasts so long! That there is no nasty chemicals in it. Love that it's natural mineral pellets not chemicals. Not having to buy detergent.